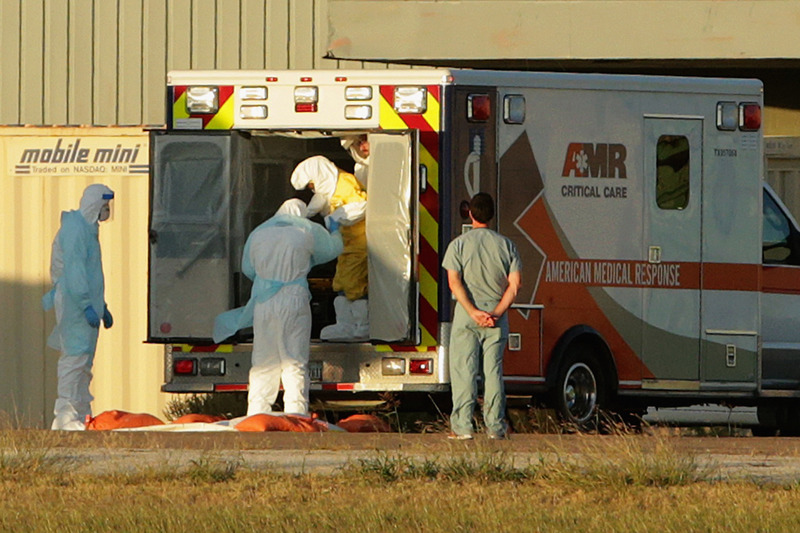 ​Ebola in the U.S.: Who pays the bills? As one of New York's 10 designated Ebola-ready hospitals, North Shore-LIJ Health System has been working around the clock to get its facilities up to par and its staff fully trained in the unlikely event that a patient with the deadly virus walks through the emergency room doors. This week, North Shore-LIJ -- a 17-hospital system that serves patients throughout Long Island, Staten Island, Queens and Manhattan -- completed work on a dedicated isolation unit for Ebola patients. Miraculously, in less than a week, the workers managed to retrofit the entire third floor of the hospital at their Glen Cove location in Nassau County, Long Island. It was a job that required building new walls, adding windows and a control room, installing new negative air-pressure units, as well as rewiring the area for video, audio and better security. The hospital even added a dedicated laboratory. When all is said and done, the price tag to become Ebola-ready could cost the hospital between $10 and 15 million, though it remains unclear who will ultimately pay the bill. "The state has asked us to catalog and keep track of the costs," Dr. Mark Jarrett, chief quality officer for the North Shore-LIJ Health System, told CBS News. "I don't know how the Feds are going to handle it. I don't even know how the state is going to handle it. This is providing something that we may never need. We're tracking our financial costs but that's not driving any decisions that are being made." Jarrett said the order by state health officials to "just keep a tally" also applies to patient care. So far, North Shore-LIJ has dealt with 20 suspected Ebola cases -- all of which turned out to be false alarms. From diagnostic testing to medical care, protective equipment, airport screenings and mandatory quarantines -- Ebola in the U.S. is becoming a pricey public health problem. Even at Bellevue Hospital, which is contending with the challenges of caring for an actual Ebola patient, financial arrangements are unclear. A spokesperson for the New York City Health and Hospitals Corporation told CBS News that the priority right now is to provide the best possible care for Dr. Craig Spencer , the Doctors Without Borders volunteer who tested positive for Ebola last week after returning from Guinea. The medical bills will be dealt with at a later date. As a public institution, Bellevue Hospital says it is committed to following through on its mission statement: to offer high quality health services "to all New Yorkers, regardless of their ability to pay... in an atmosphere of humane care, dignity and respect." Because Ebola is an infectious disease, the financial burdens go beyond just improving medical facilities, training staff and providing critical patient care. Extensive measures are also needed to protect the public and stop the disease from spreading. Ebola is spread through contact with the bodily fluids of a sick patient, so once a person is diagnosed, public health workers must spend time and money tracking their recent movements and identifying anyone else who may have been exposed. Family members and others in close contact with an Ebola patient may need to be quarantined and monitored daily for signs of illness. Even complete strangers can find their lives disrupted if an Ebola patient crossed their path. Frontier Airlines put several flight crew members on paid leave after Dallas nurse Amber Vinson flew on their plane from Cleveland from Dallas right before she was diagnosed with Ebola. No one from the plane has gotten sick. Some states are expanding their quarantine policies, mandating 21-day quarantines for all health care workers who have recently returned from West Africa. A spokesperson for the New Jersey Department of Health told CBS News the agency would not disclose details about the costs involved in the quarantine and diagnostic testing of Kaci Hickox, the nurse who was held for three days at University Hospital in Newark when she returned from West Africa last week. Kickox is currently under a quarantine order at her home in Maine, but is fighting the restrictions. In a press conference announcing the New York-New Jersey quarantine plan last Friday, New York Gov. Andrew Cuomo said that if employers don't pay quarantined workers for the time they are absent from work, "the government will." Doctors Without Borders said in a press statement that it would cover salaries for its volunteer physicians and nurses for 21 days upon their return from West Africa. Many critics say these measures are medically unnecessary and may deter doctors and nurses from volunteering to fight the outbreak in West Africa. To counter that, Cuomo and New York City Mayor Bill de Blasio announced plans Thursday to create a program of financial incentives and other employment protections to encourage health care workers to help in West Africa. The program will be modeled on benefits and rights provided to military reservists. In a statement, they said the state would "provide necessary reimbursements -- to health care workers and their employers -- for any quarantines that are needed upon their return to help protect public health and safety in New York." The federal government has several programs in place that help cover the costs of disease outbreaks and disaster-related health care on a state and local level -- though these programs have seen their budgets slashed in recent years. The Associated Press reports that the U.S. Centers for Disease Control and Prevention has doled out more than $10 billion since 2002 to help state public health care systems be prepared to respond to any potential serious disease outbreak. But a 30 percent budget cut since 2007 has led to thousands of layoffs by health departments throughout the country. The U.S. Department of Health and Human Services also grants funding through its Hospital Preparedness Program, and according to its website the program has provided more than $4 billion to public and private health care facilities. However, once this money is distributed on a local level it does not amount to much for major hospitals, said Jarrett of North Shore-LIJ. "We're doing what we need to do," he said. "I think as things settle down we'll start talking about these financial arrangements."